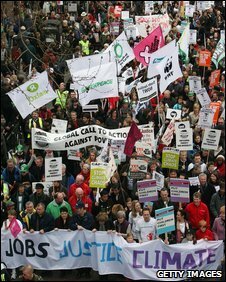 Tens of thousands of people have marched through London demanding action on poverty, climate change and jobs, ahead of next week's G20 summit. The Put People First alliance of 150 charities and unions walked from Embankment to Hyde Park for a rally. Speakers called on G20 leaders to pursue a new kind of global justice. Police estimate 35,000 marchers took part in the event. Its organisers say people wanted the chance to air their views peacefully. Protesters described a "carnival-like atmosphere" with brass bands, piercing whistles and stereos blasting music as the slow-paced procession weaved through the streets. Police said one man was arrested during the march for being drunk and disorderly. Unite union, general secretary Derek Simpson said: "I think it's an important message but whether it will get through to the people meeting in London I don't know. Anyone who sees the numbers on this march should realise how important it is." Families with children in pushchairs were among those marching along the 4.2-mile route under banners with slogans including 'capitalists - you are the crisis' and 'justice for the world's poor'. As protesters passed the heavily-policed gates of Downing Street, there were chants and jeers with one person shouting "enjoy the overtime". BBC News reporter Mario Cacciottolo said people were clearly angry, but the atmosphere was not tense. Milton McKenzie, 73, from Essex, told him: "How the hell can we have a situation here in Britain where we have people out of work and the bankers just cream it off and are helped by the government." World leaders will meet next week in London to discuss measures to tackle the downturn. See our in-depth guide to the G20 summit. The G20 countries are Argentina, Australia, Brazil, Canada, China, France, Germany, India, Indonesia, Italy, Japan, Mexico, Russia, Saudi Arabia, South Africa, South Korea, Turkey, the United Kingdom, the US and the EU. Italian trade unionist Nicoli Nicolosi, who had travelled from Rome, said: "We are here to try and make a better world and protest against the G20." Glen Tarman, chairman of the Put People First co-ordination team, said: "An exciting alliance has been born today. We will keep up the pressure on world leaders and the UK government to address our demands and put people first." TUC general secretary Brendan Barber said he wanted to see G20 leaders agree a plan of action to deal with the financial downturn. "Where I hope we will see a consensus emerge is in the recognition that unless they act together, then the problems are only going to get worse. "This, unlike any other recession, is a recession right across the world." The Energy and Climate Change Secretary Ed Miliband said it was important for the G20 to make commitments on helping the environment as well as the economy. "There are some people who will say you can either tackle the economic crisis or the climate crisis. "But the truth is that both come together with this idea of a Green New Deal, of investing in the jobs of the future, which are going to be in the green industries of the future." The director of the the Adam Smith Institute, Dr Eamonn Butler, said governments have caused the economic crisis. "The world market economy is actually a very moral system that raised a billion people out of poverty in the last 10 years," he said. A huge security operation is under way in the run-up to the G20 summit, at which world leaders will discuss the global financial crisis and other issues. There have been fears that banks and other financial institutions could be the focus for violent protests. Commander Simon O'Brien, one of the senior command team in charge of policing security, said: "It's fair to say that this [the march] is one of the largest, one of the most challenging and one of the most complicated operations we have delivered. 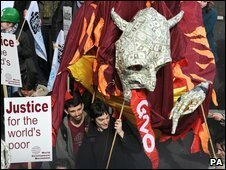 "G20 is attracting a significant amount of interest from protest groups. There is an almost unprecedented level of activity going on." 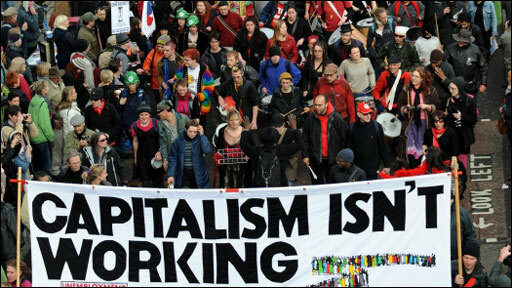 Saturday's march will be followed by a series of protests on Wednesday and Thursday by a variety of coalitions and groups campaigning on a range of subjects, from poverty, inequality and jobs to war, climate change and capitalism. Ahead of the summit, Prime Minister Gordon Brown has been visiting a number of countries seeking support. On Friday, during a visit to Chile, he said people should not be "cynical" about what could be achieved at next week's summit, saying he was optimistic about the likely outcome. However, in an interview with Saturday's Financial Times, German Chancellor Angela Merkel dampened expectations of a significant breakthrough. She said one meeting would not be enough to solve the economic crisis and finish building a new structure for global markets. In Berlin, thousands of protesters have also taken to the streets with a message to the G20 leaders: "We won't pay for your crisis". Another march took place in the city of Frankfurt. The demonstrations attracted as many as 20,000 people. Banners accused the Germany government of being too willing to spend billions bailing out financial institutions and too slow to protect ordinary workers, the BBC's Steve Rosenberg said from Berlin. Will it help the world's poorest? Is Brown the G20 winner? What did the protests achieve? Was the G20 summit a success?